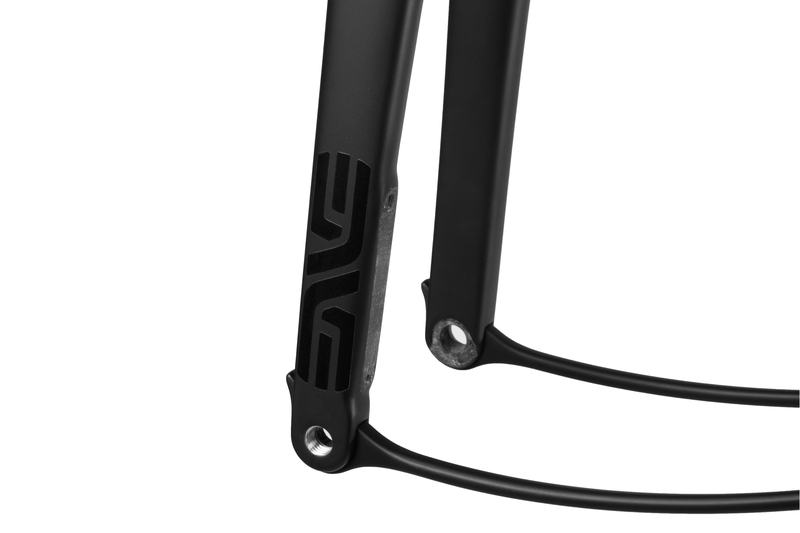 After a low-key sneak preview at the 2015 NAHBS event, ENVE confirms full production of their carbon GRD fork just ahead of this year’s show. The first small run of forks has already been divvied out, but the next shipment is scheduled for the beginning of April. The GRD fork is intended to serve the still growing gravel/all-road demographic. The fork uses a 12mm thru-axle, the apparent standard for “disc road” bike componentry. 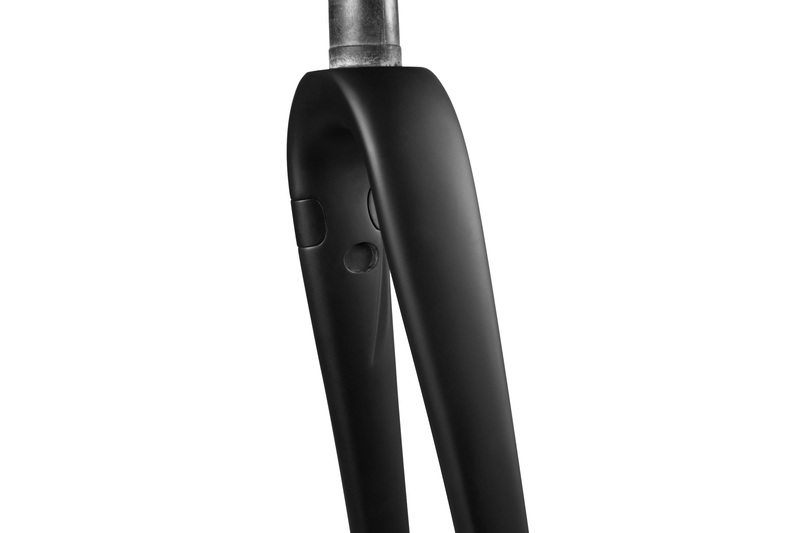 The full-carbon steerer tapers from 1.25” to 1.125”. The GRD also joins the flat-mount disc caliper bandwagon, though pix from last year’s show reveal that the prototype forks had post-mounts. The switch to flat-mount might explain the oddly long span between first glimpse and actual production. Rotors 140 to 160mm can be fitted. The GRD fork is a remarkable for two reasons. 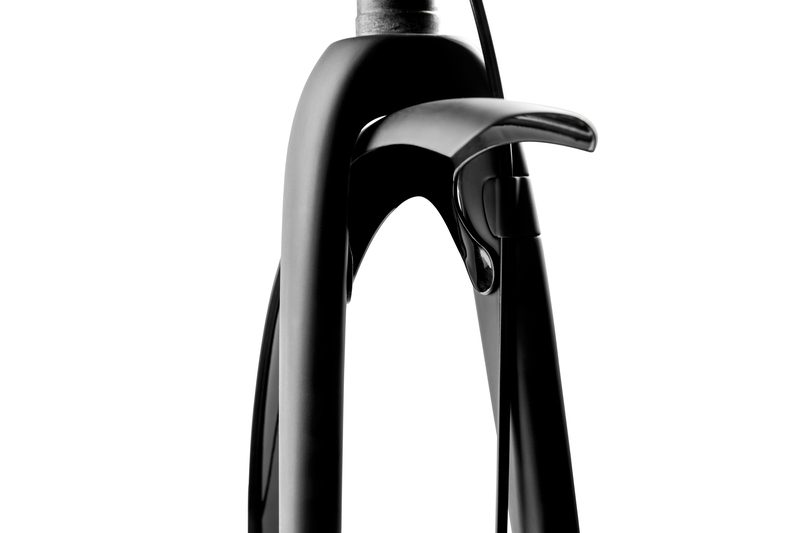 Doubtlessly most people will be talking about the integrated carbon fender, which ENVE says can be removed in seconds. Among full carbon forks of this type, the ability to cleanly mount a full fender is still rare. ENVE’s proprietary fender is a full carbon affair that snaps securely in place at both the crown and dropouts. No word yet on what the consumer is supposed to use on rear of the bike. However, the less obvious but more important consideration is the GRD’s axle-to-crown measurement. At 383mm A-C, the GRD neatly splits the distance between the 370mm of most road bikes and the 395mm virtual standard of cyclocross bikes. This means you couldn’t really retrofit the GRD to either existing road or cyclocross framesets without dramatically changing the geometry when the head tube gets boosted or dropped (on road or CX frames, respectively). Thus the GRD is designed to compliment frames designed specifically for the all-road demographic, rather than adapted from existing CX designs. On the other hand, the “gravel scene” is far from uniform in its design preferences. With a maximum tyre clearance of 35-38mm, the GRD won’t fit the 40-45mm sizes that many insist are necessary for gnarlier gravel excursions, though that much volume is getting into the realm of 29er rubber. And such tyres wouldn’t fit under a 383mm A-C anyways. 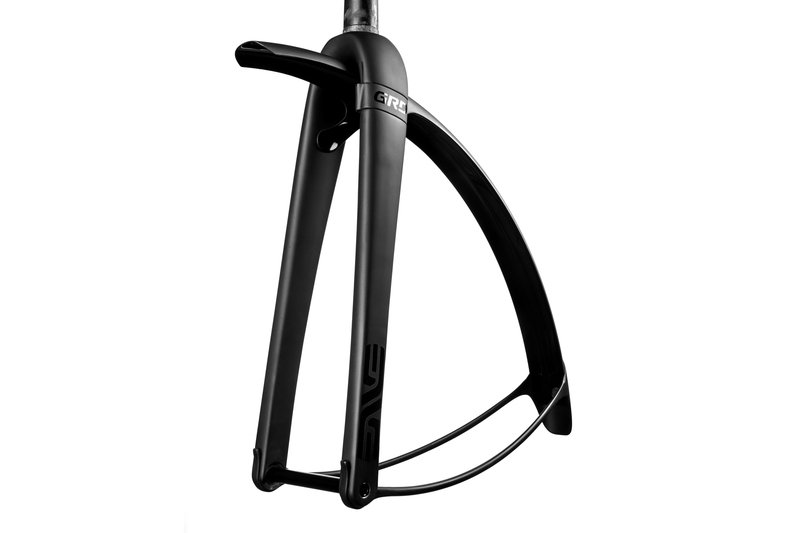 However, the ENVE fork is particularly appealing as for all-weather road bikes. I have often said that it is odd that frame designers should go to disc brakes that allow road bikes to accept any size tyre independent of the limits of short-reach rim brake calipers, and then be limited to forks that essentially still mandate tyres smaller than 28mm. 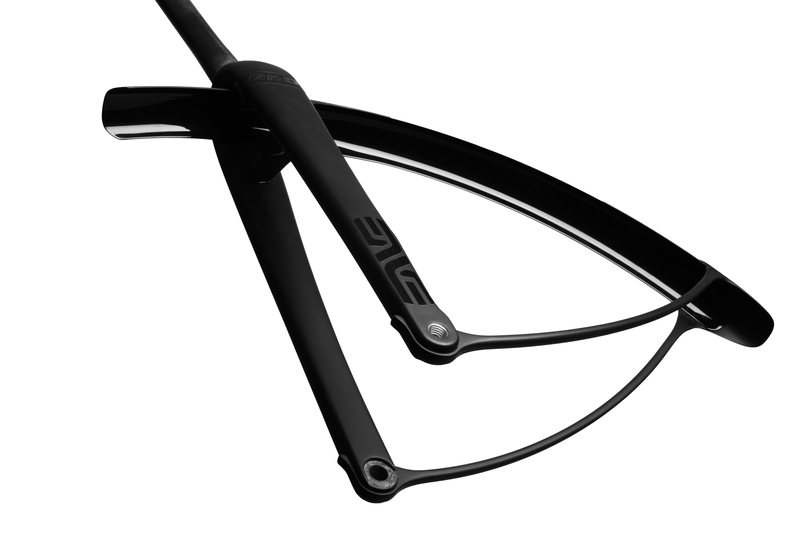 The new ENVE fork steps outside the constraint of road fork design without going all the way to CX fork height, which isn’t necessary if the front wheel isn’t going to be encased in mud-n-grass from a CX course. The 47mm rake is a middle of the road dimension; it should be amenable to most designs outside of the low trail philosophy embraced by the Francophiles of Compass Bicycles. So to whom does this fork appeal? Due to the unusual axle-to-crown height of the fork, one would have to design a frame specifically to fit this fork, and small framebuilders are the ones who can most quickly respond to the potential this fork holds. This is great news if you are now or soon to be in the market for a custom bicycle for all-road, or perhaps that high performance winter trainer.